Pianoforte, Organ and Music Warehouse, Publishing Office of "The Minim," Chapel Bar, NOTTINGHAM. 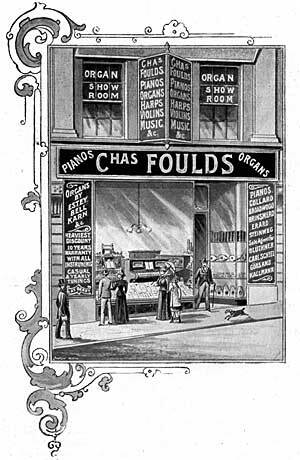 Telegraphic Address: "Foulds, Music Seller, Nottingham.'' Telephone No. 846. Telegrams: "Gerard, New Basford" Telephone 1,572. AS one of the cardinal virtues—classified indeed next to the highest aspiration in that direction —cleanliness may be said to have received an impetus within recent years, unprecedented in importance as affecting the habits of the world's civilized communities, and alike in its bearing on the development of a great national industry. In its latter aspect, with which the purport of this notice is more immediately concerned, we may direct attention to the substantial success achieved by the firm of Messrs. Gerard Bros., Limited, who were the first to introduce the soap trade to Nottingham, and whose splendidly-equipped new soap works at New Basford, are alike a tribute to their enterprise, and a noteworthy addition to the ranks of the more important manufacturing concerns in the neighbourhood. Taking advantage of a recent visit paid to the district, we availed ourselves of the courteous permission granted by the management to make an inspection of the soap works, of which a brief description may be acceptable to our readers. It should first be stated that the business was originally founded by Messrs. T. B. and W. F. Gerard in 1876, on the same site as now occupied at New Basford, and was carried on by them until 1894, when the latter retired, Mr. T. B. Gerard being the sole partner until 1897, when in order that the customers of the firm might share in its prosperity, it was determined to convert the undertaking into a limited company under its present title. This was effected in January of last year, the board of directors including Mr. T. B. Gerard, chairman; Mr. T. A. Gerard, junior, managing director; Mr. J. B. Gerard, and Mr. J. Sadler. The works occupy a space of about 4,000 square yards, close to the railway, the new premises consisting of a lofty block of substantial buildings of four storeys elevation, in which the manufacturing departments are located, and a portion of the old structure is still retained for the purposes of storage. Passing through a wide gateway we first enter the well-appointed general and private offices, and presenting our credentials are then conducted to the main building, on the ground floor of which are the frame room and packing department. The first-named is about 65 feet square, and is fitted with a powerful steam elevator of Pickering's, Stockton-on-Tees make, worked on the automatic principle, which communicates with all floors from the ground level to the upper storey. Next to this is the packing room, an immense apartment 90 feet by 40 feet, leading off from which on all sides are twelve store rooms for various kinds of soaps, each holding a stock of 25 tons in weight. Here the goods are made up and dispatched in boxes, and other receptacles which are also manufactured on the premises in a well-equipped joiner's shop provided with the requisite appliances. The manufactory proper is constructed on what is known as the gravitation principle, the boiling pans being erected upon platforms raised some 25 feet from the floor, some of these vessels having a capacity of 25 tons each. The pans are fed by a steam force pump, and a large tank is provided beneath into which the waste, or lees, is discharged. Above the boilers are the pans for caustic soda, and on the top floor are placed the tallow refining tanks, whose contents flow into the boiling pans below. Other departments are equally well furnished with improved appliances for stamping soaps, the toilet soap room, and a fully-equipped laboratory where the materials are tested and the analysis made before mixing. With the details of the latter process it is unnecessary to deal, this part of the manufacture coming more within the province of a trade secret having no bearing on the subject of our notice, and it will therefore suffice to say that the ingredients of uniformly best quality are carefully combined to produce the perfection of results in the various kinds of soaps which form the specialities of the firm. Of these may be mentioned as the most prominent features of Messrs. Gerard's manufactures their "Ino " brand, three tablets in box, enfolded in wrappers for which useful presents are given in exchange, a popular form of enterprise in the trade. The "Gerard" Washer, "Juno," Pimeni (ammoniated), Paraffin, Pink Purified Carbolic, White Windsor and finest Honey Soaps; Pales, including a free lathering quality, supplied with buyer's own name; Browns; special soaps for bleaching, dyeing, laundry and other industrial purposes; soft soaps of the ordinary kind, and carbolized for hospitals and public institutions, dog soap, and a delicious toilet variety in the "Prima Donna" (superfatted), a real luxury. Other toilet soaps are the finest milled Red Rose, Heliotrope, Glycerine and Cucumber, White Rose, White Rose and Cucumber, Honey, Brown Windsor, and special quality milled of Brown Windsor and Glycerine and Cucumber, and the larger sizes of refined carbolic and fragrant honey. These goods are held in steadily increasing estimation in the home and export markets, while the firm have also an extensive and rapidly growing local trade, supplying most of the dyers, bleachers, hosiery finishers, and the principal laundries in all parts of the country with the special soaps used in the various industries. Careful attention is given to the thorough recovery of the bye-products of manufacture, which are all contained in the waste lye from the soap pans. From this all traces of soap are first recovered, the liquor then passing to the treatment tanks, where it is chemically treated to render all useless matter insoluble, after which it is pumped through filter presses until clear, when the resultant liquid is simply a solution of salt and glycerine in water. The glycerine, of course, is the most valuable product, and is recovered by means of a vacuum evaporator (Messrs. Scott and Sons' patent), which evaporates the excess of water leaving a mixture containing salt and glycerine, which are separated by means of air pressure. We may also mention in connection with this that the recovery plant is so arranged that even the evaporated water is condensed and used over again indefinitely in the boiling pans. Throughout the establishment the utmost good order and system prevail, the whole of the factory being provided with fire appliances of the most approved type as a precaution against an outbreak, and giving employment to a large number of hands. We were present at the noon hour, and as the employes turned out we were particularly struck with their extremely healthy appearance, especially of the boys and girls employed in the packing department, whose ruddy faces thoroughly convinced us of the truth that health and cleanliness go hand in hand.